Fabric Mart Fabricistas: Made by a Fabricista: A New Wool Coat! 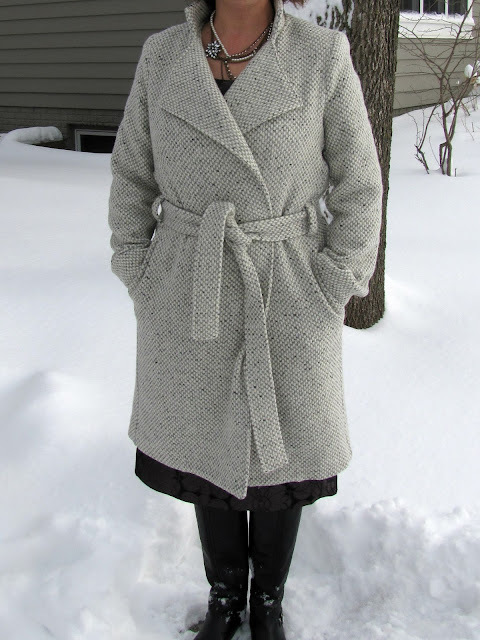 Every winter I make at least one coat for myself and this year was no exception. Living in South Dakota where winter can and has truly lasted until May, you wear your coat a lot and it is so nice to have some choices in your closet. I found this beautiful designer wool at Fabric Mart and hoped I could use it for January's blog. I was even more thrilled when it arrived as the photo simply doesn't do it justice. It is soft, heavy, and very warm, perfect for a northern plain's winter! I wanted a coat unlike one I currently have in my closet and one that was a little dressier than my others. 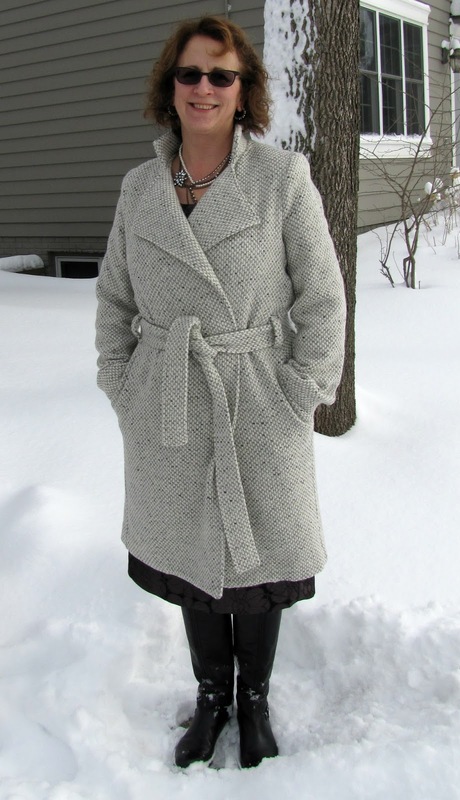 For the pattern, I choose the Stella Coat by StyleArc. Can you blame me? Look at those design lines! They are beautiful! 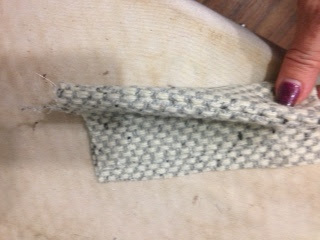 This is a pattern for experienced sewers only and why it isn't terribly difficult, it does require some tailoring techniques to make it look good, otherwise with the cross-over effect and the belt, it could easily become a bathrobe. ;( Not good! Sewing with wool is absolutely a pleasure. I prepared my wool by throwing it in the dryer with a wet towel, not just once but twice before cutting out. It worked beautifully. I love the stand collar, it is interfaced on both sides to give it that structure. With the 1/4" seam allowances at the edges, hardly any trimming of the seams was necessary. I am very proud of how the sleeves/shoulders lay. I typically make a 1/4" adjustment at the shoulders for my sloping in that area. I decided not to and knew I'd add shoulder pads. This time I used 1/2" and also made my own sleeve heads. Anyone remember inserting those? I cut one inch strips of batting and sewed that to the sleeve head with a simple whipstitch. 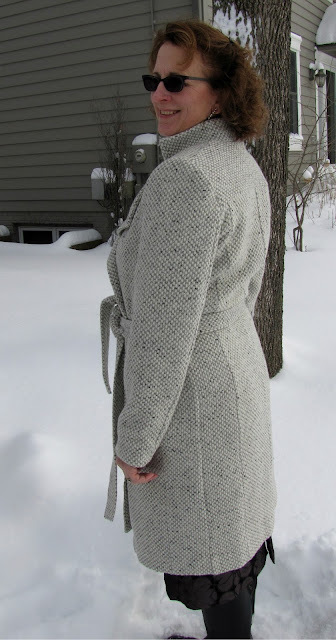 Other reviewers that have made this coat have left off the center back seam, but I choose not too because of the shaping in that area the seam allows. I don't think it detracts from the overall look of the coat. Can you tell how much I love the pockets on this coat? The placement is perfect and they are nice and roomy. So they wouldn't float around, I attached a piece of seam binding from the 'corner' of the pocket and attached it to the front seam allowance. I can't believe how cold it was when we were taking these pictures! 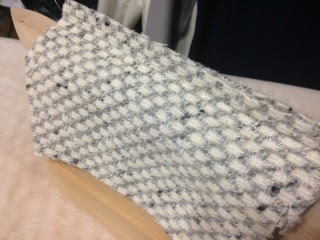 The coat is fully lined and has completely separate pattern pieces for the lining which give an amazing structure. 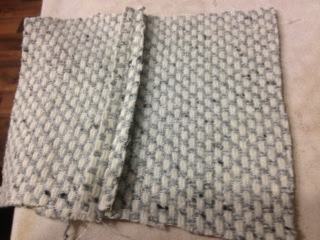 When I sew with wool, I first sew the seam with a straight stitch and then press the seam to embed the stitches. After that, I open the seam and iron it so I get a nice open seam. To press the seams open, I like using these wooden tailor boards. This one has a nice point on it that I used in the collar areas to get a nice, crisp point. After pressing the seams open, I finished the edges with my serger. Wool ravels rather easily and I want this coat to last for years! After serging, I fold wrong sides together and press again. Look at that beautiful edge! 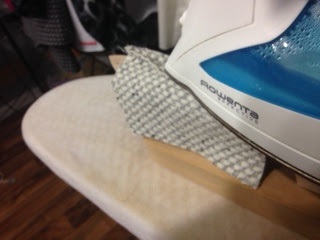 For the back yoke, I cut that piece on the crossgrain, just to give it a bit of a difference. It isn't anything that jumps out at you but is subtle. The inside of my coat is just as beautiful as the outside, I am so proud of it! I love my coat. If you've never sewn with wool before, give yourself a treat and sew up a new coat! It is gratifying, will last forever, and is a true statement piece you'll enjoy reaching for again and again! Gorgeous coat! The sleeves are set in beautifully! Thank you Becca! I appreciate your kind words! Thank you sewing km! This is a great pattern. Great pattern and fit for you. It is beautiful. This is stunning, Sue. I really like how warm you look, which I know is good in your area! :) Did you interface any of the bits with anything special (like a hair canvas) or did you choose to use other types of more readily available interfacings (like a pellon fusible interfacing)? I ask since the structure of the coat looks nice and sturdy and since that is a desire of mine for future coats, I would love to know what you did. BTW, like I have said in the past, we like the SAME fabric every single time. Of course I had to grab some of that gorgeous boucle the last time it went on sale!!! Hi Dina, I used an interfacing from Fashion Sewing Supply which was like a hair canvas only fusible. Does that make sense? In some places I interfaced both pieces, such as both sides of the stand collar and the front facing and front portion of the jacket. I even interfaced the tie waistband! Haha--we must have the same great taste when it comes to fabric! Thank you Nakisha! I love this coat so very much! Great work! This is a beautiful coat.